24th February 2019 – On different continents and in very different conditions both Hellen Obiri (KEN) and Stephanie Twell (GBR) won their respective national cross-country championships. At the Eldoret Sports Club in Kenya, Hellen navigated her way round 10km of flat and fast sports fields that had some man-made mud sections and hay bales thrown in to spice up the difficulty. Despite the usual strength in depth shown in any Kenyan distance event Hellen was able to ease away over the final two laps crossing the line in 33:15. 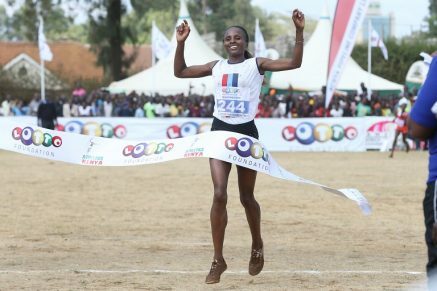 Winning qualified Hellen for the IAAF World Cross-Country Championships where she will be looking to extend her perfect form of 2019 which currently stands at three wins from three starts. On the far hillier and grassier course of Callendar Park, Falkirk, Steph showed that she still possesses the cross-country ability that brought her three European Junior titles earlier in her career to win the Scottish title. This gave her the unique achievement of having won both the English and Scottish Senior titles and also took her own winning run in 2019 to three. At the Ugandan trials for the World Cross-Country Championships held the previous weekend, Thomas Ayeko (UGA) earned his place on the team with a fourth place finish in the senior men’s race. After showing good form before Christmas in the IAAF permit meets, Timothy Toroitich (UGA) unfortunately became ill in the days leading up to the race and wasn’t able to run to his usual high standards. He will be hoping for a chance to prove himself again and qualify for the World Championships on a course that will suit his style. At the US Indoor Championships in New York, Laura Roesler (USA) completed a short but highly productive indoor campaign. Having won her 1000m heat on day 1, Laura returned for the final the following day and ran another PB of 2:36.60 for fourth place.